I have not written in some time, since I have been under considerable stress in my personal life. I don't write much when I'm in the middle of my own crises. I have no energy for it, nor do I feel I have anything to offer. But recently, a thought did occur to me which I felt I ought to share. 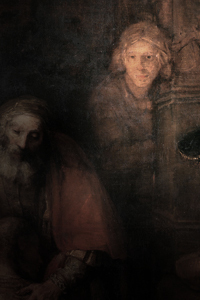 One of the many things which has troubled me lately was the cry of the non-prodigal son, the one who said, "these many years do I serve thee...yet thou never gavest me a kid." It is not that I feel I have never transgressed, because I know I have. Nor that I deserve blessings, because I know I don't. But it is hard to see how far off the tracks my life has gone. Tracks that I followed only because the Lord asked it of me, and not because I wanted those tracks at the time. I am surrounded with people who have the life I was taught to accept (and even desire.) But it is a life I'm forever barred from, all because someone I trusted decided to exploit that trust to its fullest extent. I have fought, not only to become strong, but to keep that strength from making me hard. It is a daily battle, sometimes harder than others, but something I have to fight every day. And sometimes I lose. I do not understand why I can't seem to catch a break. I just need a year or so of equilibrium, of rest, a time when I know that my kids are safe, that I am safe, and that I can heal a little. But I was looking up a scriptural reference, and ran into something that I think applies.